This crystal masterpiece is a patriotic tribute to the American Soul and Spirit. The American Spirit Award celebrates strength, courage, freedom, values of constitution, vision and unity. 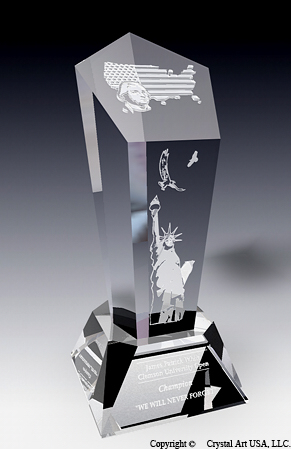 The design elements of the award comprise clever symbolic references to American patriotism. The top obelisk is shaped like a pentagon shield representing the strength to defend and protect. On the pentagon shield we feature the founding father of our nation and a great visionary - president Washington gazing into the American future.Behind him spreads an American flag in a shape of the country. The body of the shield obelisk features the Statue of Liberty tirelessly holding her torch for the huddled masses yearning to breathe free. Far into horizon, free eagles soar into the skies of freedom. Personalization text and logos are engraved on the crystal base.